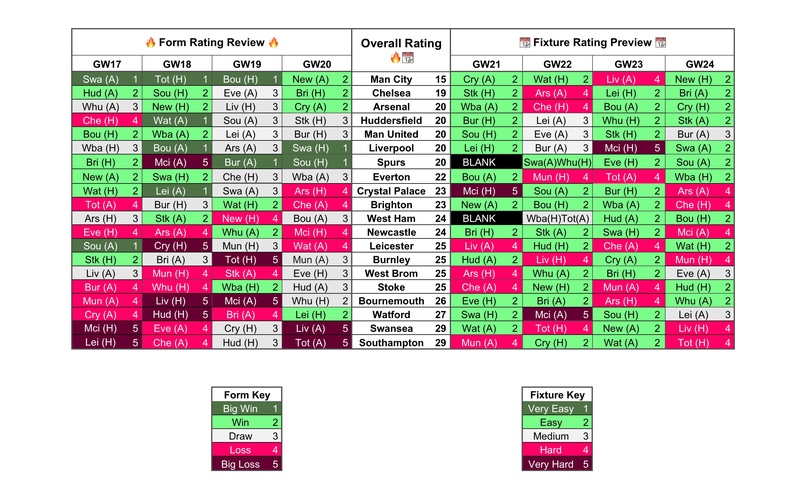 There’s less than 48 hours between gameweek’s right now so here are the Gameweek 21 Charts. Manchester City lead the way significantly once more. In defence, they’ve kept 3 clean sheets in their last 4, so it looks like a wise time to invest. Otamendi remains the standout option here. The front line has become more settled over recent weeks. Aguero is getting regular starts and has good underlying statistics, which could be converted to more goals at any moment. Sterling and De Bruyne do come in significantly cheaper and are getting vital returns consistently. Liverpool, Chelsea and Spurs have the best form. 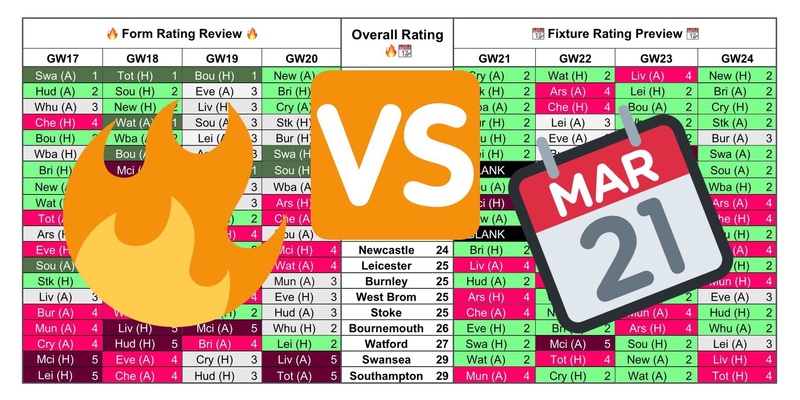 Spurs and West Ham have a blank this week so can’t be considered, but certainly hold those Spurs assets ahead of their double Gameweek which is coming soon. From Liverpool, there’s an argument for doubling up in attack with Coutinho, Salah and Firmino all firing. There could be rotation around Gameweek 21 and 22, so it’s perhaps not the best time to take a hit for one of them. Wait for Van Dijk to make his mark before looking at the defence. Morata has had a good rest for Chelsea and is a better option than Hazard, who’s currently failing to match the returns of other premium midfielders. Alonso and Azpilicueta are the ones to go for in a defence that have kept three clean sheets in a row. No teams really stand out in terms of fixtures, with Huddersfield having the easiest run. Arsenal and Manchester United don’t face too many difficulties over the next 4 either. Rotation is rife at Huddersfield, but the centre backs Schindler and Zanka, plus Mooy in attack look set to start every game. For Arsenal, Sanchez and Lacazette are returning in attack, but the defence has looked frail recently so avoid them for now. Manchester United are also struggling for clean sheets, Lingard is the form player but beware rotation.